Still finding ways to recycle the pages of this 50 cent thrift store paperback. 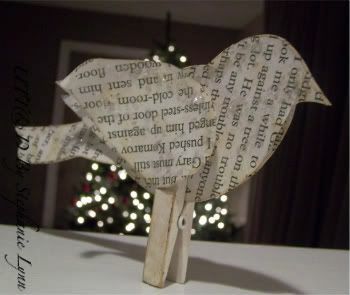 I couldn’t resist a little birdie project! I started by printing out this template. I did not make a template for the wing as I just made it up as I cut out – pretty simple shape though! 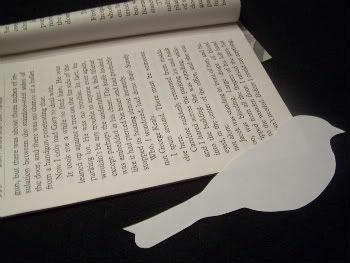 Once I had my templates I tore three pages from a paperback book, traced and cut out. 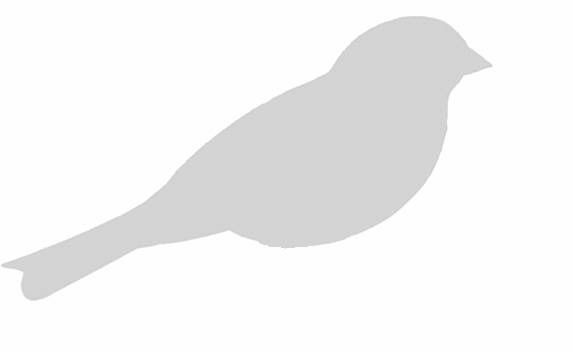 I made the shapes three pages thick so the birdie would be stiff enough to stand up straight. You could also use sheet music too, which would look fabulous! 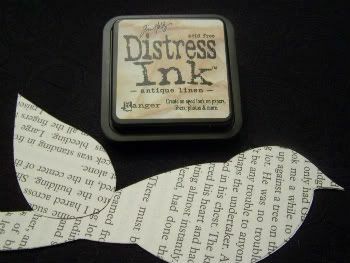 I gave my birdie a light rub with my Tim Holtz Distressed Ink Pad, making sure to get the edges a little darker. 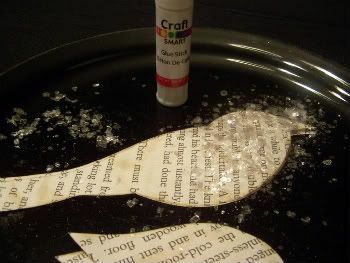 I added a little sparkle by gently rubbing a glue stick onto the shapes and dusting with my favorite vintage mica flakes. For the base I simply used a regular ole’ wooden clothespin ~ They stand up perfectly! I gave it a light coat of Heirloom White, sanded and distressed the edges just a bit. Standing upright the clip nicely holds the birdies body in place. The wings were then stuck onto the side of the clothespin with a dab of hot glue. I curled the edges of each wing just a bit by rolling the paper around a pencil. I may add a pearl button eye… but kind of like him the way he is! Enjoy! Very clever idea. This turned out great. Thanks for the tutorial. Thanks for the How-To on this. 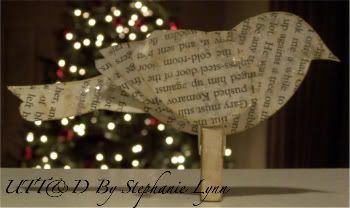 I love these birds and can’t wait to make one! How pretty in a Christmas tree as an ornament too. Very cute. Thanks and have a Merry Christmas! would love to try these. can’t decide which i like better, the bird or the rolled paper flowers or the felt flowers. all so sweet. Absolutely gorgeous! 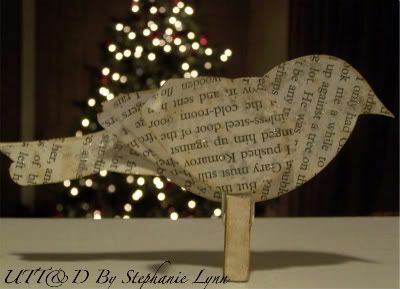 I’m thinking an ornament like this would be perfect for any tree! Thanks for the How-to! I need to get some of this distressing ink everyone is using. Any tips on applying it? Thanks for stopping by my blog and making a sweet comment! i made a couple of these a few weeks ago and forgot to post about it! crafty minds think alike! love them! So pretty, and a great way to reuse stuff. Thanks for sharing. I hope you and your family have a MERRY CHRISTMAS. This is delightful. I have a ton of books that want to become birds just like these!! I love this! I’m on a vintage book project kick too! Your home is beautiful. Loved all your decorations! Great blog, will be back! What a cute little bird…thanks for sharing him! MERRY CHRISTMAS to you and your family! Thank you very much for the wonderful tutorial, I will post my version of it… can I give you credit? Happy New Year greetings from Mexico! I forgot to thank you for the inspiration. 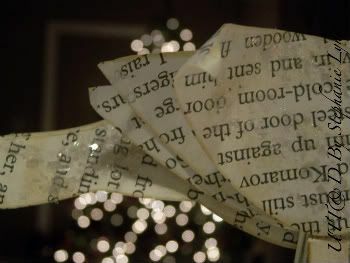 I also made ornaments out of a book and had some left over. So I made another ornament spelling out the name to give to our babysitter. I really liked how it turned out and think it would make a cute gift for anytime of the year. I just did a quick post on you and your tutorials (your birdie here and the flowers) and linked to you in each instance. I’m glad you commented on my blog. Thanks and blessings! I’m in LOVE with him…I love anything with birds! I surely enjoyed it from the beginning to the end! I appreciate your time and patience in order to crate such a beautiful little craft. j’ai visité ton blog par un lien mis sur un autre, je cherche des tutoriel de scrap, mais en… français !! J’ai trouvé tes oiseaux vraiment superbes, d’autant que bientôt Noël sera là (si si le temps passe vite) pourrais-tu me le faire suivre en français ? Voici mon e-mail : [email protected] je te remercie par avance. Et encore bravo pour tes créations. SO many times I read stupid post but this time I must say i’m impressed! Well done! Cheers!